I am Rev. Dennis Mulele, the CCAP Blantyre Synod Sunday school and Acting Youth Director. I welcome you all to visit this department whenever you are around the Synod offices which are allocated along the Chileka road near Henry Henderson Institute Secondary school in Blantyre. The Blantyre Synod Youth Department was established in the 1950's in order to facilitate and implement youth activities within its jurisdiction. However, the Sunday school division started on the inception of the Church of Scotland Mission in 1876. The boys and girls brigade followed in 1910. Its purpose was to facilitate bible studies among the youth. Through youth camps at the lake, parading and sporting activities, many youths were attracted but at one time it was banned in Malawi for political reasons. 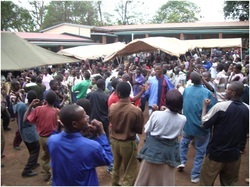 CCAPSO which started initially in 1998 at the University of Malawi, the Polytechnic, was officially launched in 2000. The Minister’s Children Association was launched on 28th December, 2008. In June, 2010, the Blantyre Synod established the Sunday school department in order to elevate the status and importance of children's work in the church. Mission Statement: In line with the mission of the Church of Central Africa Presbyterian, Blantyre Synod, the Synod Youth Department is committed to well structured and coordinated management and leadership. This will be achieved through empowerment, promotion, mobilization and networking. Read more about the youth department HERE. The CCAPSO was formed in the year 2000. (Pictured on the right is the CCAPSO Travelling Secretary, Mr. Joy Jim Khangamwa.) In the 8th April 2000, the first Synod Executive Committee was elected at a meeting held at Limbe CCAP church. This committee was given the task of spearheading the formation of CCAPSO in schools and colleges. CCAPSO is an organisation which is biblically based, reformed in theology and evangelical. Our aims are to help the presbyterian students to worship God. This is not just in meetings with spiritual songs but with the students monies, bodies and whole lives. We aim to serve other people both Christian and non-Christian by feeding the hungry, caring for orphans, visiting those in prison and sharing the Gospel with all.